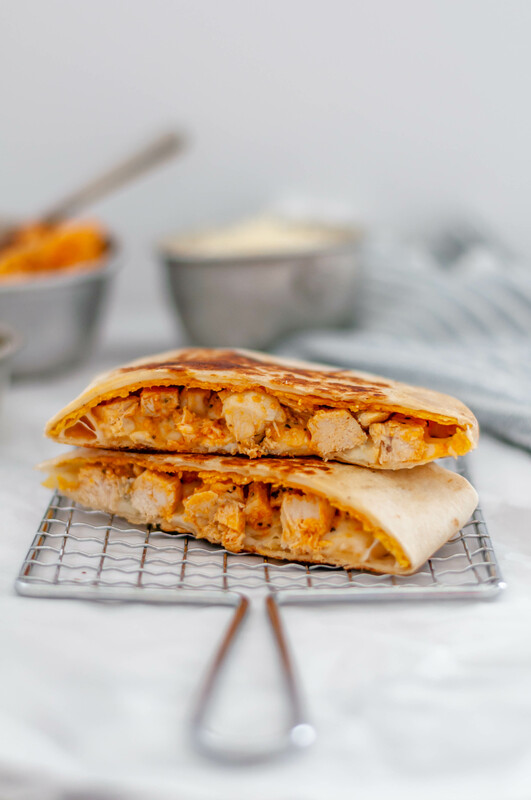 Meet your new favorite craving, Buffalo Chicken Crunch Wraps. Spicy buffalo chicken, mozzarella cheese, blue cheese and a crunchy tostada all wrapped up in a large flour tortilla and cooked to crispy, melted perfection. Ok, so I have to start this post with admitting that I’ve never had a crunch wrap from Taco Bell. But I do know the components and understand how glorious the combination can be. I just don’t like TB. But a homemade version?! I can totally get behind that. I, of course, couldn’t leave it alone and do a straight copycat recipe so instead I buffalo-ed it. Because everything is better with buffalo sauce in my opinion. We start off with huge, burrito-sized flour tortillas. We also need tostada shells. You can usually buy them at the store or you can fry corn tortillas on both sides until crispy. Cooked, diced chicken, a super simple homemade buffalo sauce, shredded mozzarella and crumbled blue cheese finish out the ingredient list. I used chicken I had cooked in the Instant Pot and had leftover. You could grill it, use leftovers like I did or even use rotisserie chicken. It gets tossed in a mixture of hot sauce butter and garlic powder then we’re ready to assemble. Let’s get down to the assembly now. Lay out the flour tortilla, sprinkle it with some mozzarella, top with a tostada shell, spread buffalo chicken over the tostada shell, sprinkle with more mozzarella and blue cheese and fold that baby up. Once it’s folded and ready, melt some butter in a hot skillet (preferably cast iron) and cook both sides until golden and crispy. YOU GUYS. You are going to want to eat these all the time. And think about the flavor possibilities. You could go the traditional taco route or mix it up with a cheeseburger or sloppy joe situation. It would just all be so good. For now though, you’ll find me enjoying all the buffalo chicken crunch wraps. Meet your new craving, the Buffalo Chicken Crunch Wrap. Spicy buffalo chicken, mozzarella cheese, blue cheese and a crispy tostada shell all wrapped up in a soft flour tortilla and cooked to crispy perfection. Heat a small saucepan over medium heat. Add butter, hot sauce, garlic powder and pepper. Let simmer for a minute then add the chicken. Cook until heated through. Remove from heat. Heat a large skillet over medium heat. Lay out the flour tortillas on plates or the counter. Sprinkle each with 3 tablespoons of mozzarella each. Top each with a tostada shell. Divide chicken among the tostada shells. Sprinkle each with another 3 tablespoons of mozzarella and 1 tablespoon of blue cheese crumbles. Fold the flour tortilla up until it's completely covered and closed up. Place a heavy glass on each to keep them closed as you cook the others. Melt 1/2 tablespoon of butter in the hot skillet. Cook the crunch wraps for two minutes per side, or until golden and crispy. Cut in half and serve hot. Yes please!! This looks so good and super easy to throw together. Thanks for sharing.